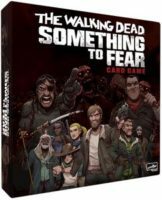 The Walking Dead: Something to Fear is a simultaneous card selection game with variable powers for 2-6 players and uneasy partnerships. Players must outwit their frenemies in order to acquire the best sets of cards to win the game, but if players aren't careful, the group will be overwhelmed and everyone will lose. In The Walking Dead: Something to Fear, players attempt to survive nine waves of walkers and brutal villains while collecting supplies and weapons in the post-apocalyptic world of Skybound’s acclaimed series, The Walking Dead. Game should be released in 2019 Q2 (05-21-19), so watch the news!